Since I still have Halloween decorations up, I might as well share some Halloween pictures. Oh, Thanksgiving was nice too. Hallo friends and family! This is a day late because it was Thanksgiving yesterday, so our P-day got moved back. I am thankful for all of ya’ll! I really love hearing from you. Every email I get makes my day. You guys are, as we say in Dutch, an “inspiratzie”! This week was one of the hardest but also one of the best weeks of the MTC (sounds dramatic, but keep in mind I’ve only been here 3.87 weeks, which allows for some drama legroom). Let me start of with saying that Thanksgiving in the MTC was awesome. The morning started with a devotional from Elder Uchtdorf! I love that man. He talked about our divine calling as missionaries. I felt the Spirit so strongly when he talked about the people we are going to touch with our message. After that amazing spiritual experience, the spirit kept face-punching me throughout the day…we got to do a fun service project, listen to some beautiful performances, hear from some other leaders, see the lights they put up for Christmas, eat a wonderful meal, watch The Other Side of Heaven, and listen to Christmas music! There were tears, there was laughter, there was turkey…so you could say it was a pretty great Thanksgiving. I wonder if the fall I come back I can sneak into the MTC for Dankbaarheid’s Dag. This week, I’ve been thinking a lot about trials. Ever since I started my mission papers, I have struggled with mental illness. It’s brought some dark days, especially in the MTC. It’s really hard to serve when you feel darkness and despair, even if you know rationally that you are worthy and everything should be fine. Despite all this, I have never known or been closer to my Savior than in those moments of darkness. When you have to be totally reliant on Him, you grow to know Him. I know my Savior Jesus Christ more than I ever thought possible. I spent a lot of time silently praying this week and have been incredibly blessed for it. I know his Atonement is real; it has been close to tangible for me. I know He loves me and suffered specifically for me. I love the scripture in Mosiah 23:21-22, “Nevertheless the Lord seeth fit to chasten his people; yea, he trieth their patience and their faith./ Neverthless–whosoever putteth his trust in him the same shall be lifted up at the last day.” I know my struggles with OCD have deepened my testimony of the Savior. I am not sure how long I’ll have to deal with it, or all the reasons why it happens, but I absolutely know I have it for a reason. I know without a doubt that God is at the helm of my mission. I have literally felt comforting angels this week, and I wouldn’t trade that experience for anything. I cannot even imagine trying to face things without Jesus Christ, and that’s why everyone needs to know about Him! There is endless peace to be found in the gospel, and the happiest we can be comes from sharing this peace with others. Zuster Tulaga leaves on Monday! I am so sad to see her go. We’ve grown so close, and she’s taught me so much. I know that she’s going to change lives in Suriname. I’m excited for my new companion–she is the only Zuster learning Mongolian in the MTC! I’m going to be a single Zuster in my class, but we will do everything else together. Alrighty, my time is officially up. I love all of you and hope you have a wonderful week! Remember that Heavenly Father always answers prayers. He will always be there. I love him and my Savior Jesus Christ. Hallo jullie! (Make note..this email isn’t specifically for a Julie (Sorry Julie). “Jullie” means ya’ll in Dutch) This was one heck of a great week. The greatly experienced and seasoned 2 week-missionaries always told us that if you get through your first week, the MTC is so much better. I was kinda confused because I didn’t think the first week was that bad…but it definitely got better than I could have imagined! My favorite thing about being a missionary is that your whole life isn’t about you at all. I truly believe that the key to happiness is being completely selfless. You can’t worry about yourself when you’re busy learning Dutch and the gospel to teach people about the most important things in the universe. I am so blessed to have this opportunity. This week was super eventful, but I’ll just outline some awesome things that happened. On Sunday, Zuster Tulaga and I woke up to, “NO FREAKIN WAY, COME LOOK OUTSIDE!” It had snowed that night! Zuster Tulaga has seen snow before, but not very often since she’s from New Zealand. It was super fun to have a winter wonderland! I hope it snows again before I leave for tropical paradise on December 12th. Sunday night devotional was one of the most powerful spiritual experiences I have ever had. A singing group whose name I can’t remember came and sung about Jesus Christ. It was a constant flow of tears for me as I thought about all our Savior has done for us. The Savior’s goodness and mercy is endless! I am so excited to teach people about Him. His sacrifice for us enables us to change in miraculous ways—ways I need each day! The Savior’s grace is endless. Something I have learned this week is that you don’t have to lose your personality to be a missionary. The first week I was so worried and uptight about exact obedience that I stopped being me. This week I’ve learned that God gives us special gifts to serve his children–one of which is our personality! I can be bubbly and goofy and still be a good missionary. I am super grateful for Heavenly Father’s patience with me through this long learning process, especially because I have a lot to learn. He is so patient with his children. My testimony of the prophet President Russel M. Nelson and the apostles was greatly strengthened this week. Gary E. Stevenson came to speak to us on Thursday, and it was awesome. I learned so much, including that I need to be doing more to study out of Preach My Gospel and the missionary handbook. The next day in personal study, I got the prompting that I needed to read some of President Nelson’s talks. I’m so grateful for his counsel and encouragement. I know that he is a prophet of God. He receives revelation for the whole church. If we heed his counsel, our lives will be so blessed. I encourage ya’ll to read the words of the prophet, President Nelson. I promise you will feel peace in your life as you follow his counsel to read the Book of Mormon, serve others like Christ, and pray earnestly to Heavenly Father. The last and saddest thing I saved for the end: Zuster Tulaga is leaving in 2 weeks! I will get a new companion(s) for the last 2 weeks. Something is up with her visa. I’m super sad, but I know we’ll probably be companions again in the mission since there’s only around 4 sisters. I’m so thankful for her and everything she’s taught me about how to be a good missionary. We have been fasting and praying for her to learn all the Dutch she needs before she goes out. I have no doubt she could leave right now and still preach with power, but I know she’s nervous. I hate seeing her worried, but I know everything is going to work out like it’s supposed to. I hope ya’ll have a wonderful week! Ik houdt van yulllie een tots zeens! These are the girls I’ll probably be companions with! We just moved into their room. I love them! One of my favorite things about them is that they stay positive. It seems a little out of order to post Emily’s first letter without sharing our goodbye. I can only share from my perspective how things went and how I felt. I think things were different for each of our family members. In the weeks leading up to Emily’s departure, I could only feel excited and happy for her to have this opportunity. I felt much the same way as I did when she left for BYU last year. Admittedly, gathering all the paperwork, clothing, supplies, etc. she would need to live in a third world country on the Atlantic coast of South America was overwhelming. But I could only feel happy for her. These feelings continued when we dropped her off at the Tucson airport to report to the Provo Missionary Training Center for 6 weeks of training and lessons in Dutch. Our family took two cars to the airport because we had to go separate directions after the drop-off. Emily rode in my car because she couldn’t handle Dad’s sensitivity. She was already feeling nervous and overwhelmed and needed a little levity and normalcy. We talked and laughed and enjoyed ourselves. I had the song, “God Be With You ‘Til We Meet Again” running through my head since the night before when she was set apart and our stake president said those same words, but I tried not to sing it out loud so that she wouldn’t feel sad. I got a little emotional watching Makayla and Emily say goodbye. I felt sad for Makayla because I knew she would really miss her sister. I also felt a knot in my stomach when she walked toward security. It was a weird emotion–not happy or sad, maybe more excited and nervous. Mostly, I was praying that everything would go OK for her and that she would feel peaceful and calm and if she needed help, then she would find the help she needed. So, we said goodbye and she walked to security wearing one of my favorite shirts which she had stolen from my closet that very morning. I let her have it because that’s what moms do. I drove away from the airport waiting to feel like I was going to cry, but I didn’t. That evening, however, I felt some anxiety. I wondered if she had trouble finding her shuttle from the airport to the MTC, if she was able to get there in time for dinner, or if she felt nervous or scared. And that’s when the lump came. It wasn’t because I was sad about her being gone. It was because I didn’t want ber feel sad or overwhelmed or nervous. And if she felt these things, I wanted to be there to comfort her and help her. She arrived at the MTC on Tuesday. Missionaries have one day a week called Preparation Day or “P-Day” when they can write to family, do laundry, etc. 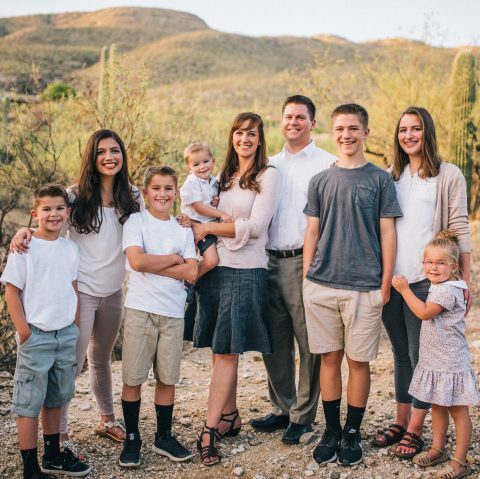 In the mission field, P-day usually falls on Monday, but in the MTC, there are so many missionaries that P-days are rotated. We had no idea when her P-day would be, so every day I anxiously checked my email waiting to hear from her. As the days went by, I just knew she was having a hard time. I prayed for her, and that was all I could do. I was overly emotional and probably more sensitive with the kids and Rick because I had this knot in my stomach–just waiting to hear. A whole week went by. I thought, “Surely if she arrived on a Tuesday, we would hear from her by Tuesday.” Nope. So, then I thought about the giant pile of laundry she probably had at this point. That might seem weird to you, but you should know I think about laundry every single day. It’s probably because we have a large family and I face gathering, washing, drying, sorting, folding every day. When we’re on vacation, I still have to think about laundry. I have to tell the kids where to keep their dirty clothes, if I will be able to wash them and when, and to please put clean clothes back in their suitcases. See . . . laundry is a big deal for me. And I wondered, when would Emily be able to wash her clothes if she hadn’t yet had a P-day? Tuesday came and went. Wednesday too. Still no word. Her friend, Soeur Clark, who got to the MTC just a few weeks before her said in her Friday email that she had seen Zuster Mergenthaler. What a relief it was to know that she was there and that a good friend had been there to see her and give her a hug. And then Thursday came, and we got a letter. The 9 days of waiting were worth it! In her letter to her family, she shared that she desperately needed to do laundry (I knew it!). She also shared some of her struggles over the past week. She shared how inadequate she felt and that she felt just plain emotional about little things. She talked about her worries about not being good enough to serve a mission. These fears are real and debilitating for her. And these are the types of things that make sending a child on a mission the most difficult for me. It’s knowing that things will be hard, she will have bad days, she will get sick, or somebody will say something hurtful, and that when these challenges come I can’t be there with a hug and comforting words. That’s the worst part about having a missionary. I also know, however, that even in the most difficult of circumstances when I can’t be there, she is not alone. She will have the help she needs when she needs it. Help will come from her companions, mission president and his wife, people she teaches, and most importantly through the influence of the Spirit tell her she is good enough and she will be OK. With this in mind, I can let that knot leave my stomach and be happy and excited for her all over again. It’s going to be a great 18 months! Hallo everyone! For the title of this email, I refer you to my favorite tool, google translate.The first week at the MTC (missionary training center…where I go to get smart about sharing the gospel) was amazing! I only have 20 minutes left to write, and my pinky muscles are burning, so this is going to be short and sweet. The flight went well. I wish I would’ve shared the gospel with the ancient couple next to me. They were super funny. She was mad at him because he left her outside and forgot about her. He was profusely apologizing. They made up in the end, but the lady told me, “Don’t marry someone more than 5 years older than you, or the golden years won’t be so golden!” Hahaha. I promised to keep it in mind. I got to the MTC that night and spent a night in some random people’s room. The next day, I met mijn collega (my companion), Zuster Tulaga. She is AMAZING. She is from New Zealand and has the coolest accent. She served for 7 months in New Zealand while waiting for her visa and is going to Suriname just like me! She speaks 5 languages-English, Samoan, Tongan, Philippines, and now Dutch. Her testimony is one of the most powerful things I have heard. She has a very strong faith in the Lord. I love her. She and I are very similar in our faith and very goofy. She is the one you have to thank for all of these pictures because she’s super good at taking pictures. She has taught me so much. I’m so happy I’ll probably get to be companions with her again in Suriname. One thing she’s taught me is to unconditionally love people. Zuster Tulaga is SO good at loving others. She takes time to check up on everyone around her. She always says is “Trueeee!” in her New Zealand accent when I tell her something interesting and shouts “This one!” when I do something goofy or dumb (so about 20 times a day). I hope to perfect my New Zealand accent by the end of these 6 weeks with Zuster Tulaga as mijn ondervijzen (my teacher). My district is heil leuk (super cool). There are 10 people going to the Netherlands/Belgium and 5 going to Suriname. 3 of those 5 are Zusters (including me), which means we will more than double the number of sisters preaching the restored gospel of Jesus Christ in Suriname. Whoop whoop! Dutch class is kinda like getting tipped on your side, having your ear hole opened, and being pressure washed to your brain because we have to learn so many words hahaha. It’s super great though, and I can testify that the gift of tongues is real. Not that I’ve had any huge experiences where I remembered everything I studied right away, but just the fact that we are able to memorize hundreds of words and phrases a day in our language study and classes is super amazing. God is a God of miracles, and I’m am grateful for the smallest of miracles from Him. I have had so many spiritual experiences here I don’t think I could write the half of them, but I do want to share a couple. Our first lesson we taught in Dutch was on Monday. Zuster Tulaga and I wrote out the phrases we wanted to use, but I felt like it would detract from the spirit if I brought my notes in, so I didn’t. We went to the lesson and as soon as I entered the room, the Spirit was so strong….strong enough that I forgot ALL my Dutch except “Hallo, ik ben Zuster Mergenthaler van de kerk van Jesus Christus van de heliegen der latste dagen” (Hello, I’m Zuster…from the Church of Jesus Christ of Latter-Day saints). I don’t remember much that was said in that lesson, but I do remember the overwhelming spirit of love and peace that I felt. It was truly amazing. I have felt that same spirit every time we have gotten to practice teaching. As soon as I enter the room, the anxiety about having to teach in Dutch is entirely replaced by the Spirit of God. I know God blesses His zendilingen (missionaries). I am so lucky to be able to know and share the gospel of the restored church of Jesus Christ! Another experience I had was after devotional Tuesday night. We council as a district after every devotional. Something that stuck out to me was the video we watched at the end of the devotional. It was of Christ helping Peter walk on the water. As Peter starts to sink, Christ’s eyes really stuck out to me. Jesus Christ was pleading to Peter “Just look to me. That’s all you have to do. I have atoned for your sins, weaknesses, shortcomings, pain, suffering, fear…ALL OF IT.” Every time I think about Jesus Christ’s eyes pleading to us to look to Him, I feel a joy and gratitude that fills my soul. I know the atonement of Christ is real. He counsels “Look unto me in every thought. Doubt not, fear not”. I know that as we look to Jesus Christ and take advantage of His sacrifice for us, we can be cleansed of sins, rise above shortcomings, and find peace amidst the storms of life. We can truly become like Him. I am so grateful for my precious Savior. I have learned more about His love, attributes, and kindness this week as I have taken His name upon me. I love Him. If you are not feeling this love, I encourage you to plead with your Heavenly Father. I have never had a time in my life when I have been denied the peace of the Savior. Zuster Tulaga and her cute sister, Sister Umaga, going to Colorado. She left this week. I love them. They are goofballs. My favorite people: Zusters Tulaga, Day, and Lloyd The pic in the background is Moses parting the sea. Dem Provo mountains thoooo. District minus three elders Writing secret letters to the girls in our hall. Never enough. And, no, I’m not referring to the overplayed song from the soundtrack to The Greatest Showman. But since we’re talking about The Greatest Showman, did you know Gavin calls it The Greatest Snowman, and his favorite song is the very first one on soundtrack with the stomping? Well, now you know. Do you ever feel like no matter what you do, how hard you work, how much you change for the better, that you’re always behind? Do you ever feel like you are not doing well at anything? Or that when you succeed in one area, another lags? I’m sure there’s more. I sound like a grumpy nag. Not all of those phrases are bad, or even all that negative, but do they inspire greatness? What if I were to receive that much criticism and instruction in one day? I would feel like I was never enough. I would feel like I was never making progress. I would believe that any efforts to improve or change wouldn’t be recognized. So, why would I even try? I do realize the critical remarks above were not directed at just one child, but I do know the proportion of negative to positive comments is way out of balance. I don’t dole out nearly so many words of appreciation, confidence, or encouragement as I should. So, one night while Rick and I were away from the kids for a date, we talked about how our children need more positive communication and encouragement from us. As we drove home, I remembered that kind words and compliments can inspire greatness and help people to achieve their potential. I made a personal goal to be more positive and thought about how to inspire the kids to work hard without constant nagging and criticism. I considered my tone and my words. I thought about how I could recognize the good things and deliver hefty helpings of praise at each interaction while also encouraging them to push a little harder to do a little more. And then Rick and I walked in the door at nearly 10 pm and I saw the mess in the kitchen, the TV on, homework not completed, kids not in bed, and nobody taking responsibility. My critical remarks started up again just like that. It’s been a few weeks and I still haven’t changed. I am thinking, “Will I ever get better? Will I ever change? Will I ever be enough?” Because just like the kids, I constantly mess up and I often feel like I just can’t do anything right. And when I do something well, another area suffers. Going to the temple is an example of this. I have been trying to make worship and service in the temple a higher priority. I feel especially drawn to do temple work because I have been doing family history work and have about 1300 ordinances just waiting for me (or my family and friends because I’ll share). I have been able to go each week for about a month now. I love to be there. I feel peaceful and content and think that the sacrifice of time and energy is worth it. And then I come home and see that my family has suffered in my absence. The house is a mess. The little ones haven’t eaten or they’re not in bed. The kids have consumed way too much Netflix, and our home life doesn’t seem to be as happy and orderly as if I stayed home to care for everyone. For me, temple attendance is not just a sacrifice of time or gas in the car, temple attendance includes a sacrifice of my usual duties as a mother and it’s a hefty price to pay. Time and energy are limited resources. Prioritizing tasks to fit these limited resources is one of the greatest challenges I face every day. I know I will never have enough time or energy to accomplish all that is good or necessary. If I spend time reading with Brooklyn, the dishes pile up. If I keep the kitchen tidy, there’s laundry. If I focus on laundry, the yard is a mess. If I spend time working in the yard, the house blows up. Sometimes, I can’t make dinner because kids need help with homework or I’m driving them to and appointments and practices. Sometimes I have a church lesson to prepare during my limited “sit down time” and I can’t balance the checkbook or make phone calls. Sometimes I get headaches and I’m completely useless. And no matter how efficiently I work or how hard, there are tasks missed, and people who feel neglected. I have noticed that when I am overwhelmed, overworked, or feeling unappreciated that I am much more critical. It’s like I’m begging my family to notice me and help me. Of course, it doesn’t work. Instead of coming to my rescue, they mirror my criticism. With my faults pointed out, I feel even more inadequate. My grumpiness spreads like a virus to my family. It’s a horrible cycle. Nobody is happy. I was thinking about this last night as I fell asleep and had a horrible dream. Our bathroom was flooding and I was trying to find the shut off valve to the water. The water kept gushing out from under the sink and filling the room. I tried a few times to swim down to the shut-off, but as I struggled with the valve, the entire knob came off, making the water gush even faster. I was drowning and I couldn’t stop the water. Everything I tried made it worse. I swam to the top and started screaming, “Please!!! Can somebody help me? Our bathroom is flooding and I don’t know how to stop it.” I knew my family was just on the other side of the door, but they weren’t coming to my aid. I thought I could hear them say, “She’s always making a big deal out of things. She can fix the leak. It’s her job to take care of these things. It’s not like yelling will solve the problem. She should stop yelling and take care of it. That’s what she gets for not fixing it sooner.” After a few desperate minutes, helpers arrived to stop the water, but they were angry and resentful. They had been inconvenienced by my crisis and were unable to complete the things they wanted to do because they had to help me. I felt horrible that they came to my aid. I thought that if I had tried harder, I could have stopped the leak on my own. I felt like such a failure. Why do I have such horrible dreams? It really is so creepy to me how much they apply to how I feel. Not only do I identify with my drowning self in the dream, I understand the helpers. How often are my family members drowning while I stand by and criticize? “They need to work harder. They always make a big deal out of things. I can’t take on another person’s work because I have so much of my own to do.” When I do come to their aid, do they feel loved, encouraged, and forgiven or does my resentment and frustration cause them to feel like failures? What is the solution? There will always be way more for me to do than I can do myself. I need my family to help. But will they help if they only hear criticism from me? How can I avoid those crisis moments when I’m at my worse, and how can I inspire greatness in my family and encourage them to see and tend to each other’s needs with kindness and love? Can “never enough” be OK as long as everybody is giving their best effort and responding to each other in generosity and kindness? If I feel overwhelmed sometimes–even if I have brought the problem on myself–don’t my family members feel the same way? How do I want others to respond to me when I’m in crisis? How can I look beyond my own challenges to respond to their needs in a loving way? Independent Woman: Do everything I can on my own without complaint. Since I’m not SuperWoman, I can’t get to everything and our family sprials into disorganization and unmet expectations. Neglect: When I don’t want to do it all on my own and I am tired of being a grumpy old nag, I just leave what I can’t get to and hope somebody gets the hint. This rarely works. Often, this causes the “resentful helper” to come to the rescue. They step in and pick up the pieces, but they’re not happy about it. What are your ideas? I’d love to hear them. Especially since this post has been super long and I still don’t feel much better about things. Here, maybe a few cute pictures will cheer me up. Yep, that’s a little better. Now I can get to all those things I have been neglecting while I was writing about all the things I have been neglecting.